Live music club ‘The Mine’ at Wee Red Bar is now one year old, making the oldest of several live music club brothers and sisters such as ‘This Is Not A Toga Party’ at Maggie’s Chamber, and ‘CD Quality’ at Henry's Cellar Bar, and proud parents Angus Ross and Chris Elsheikhi of Bainbridge Music are about to give birth to twins ‘Amplified’ at Electric Circus and ‘Your New Favourite Band’ at Sneaky Pete’s. 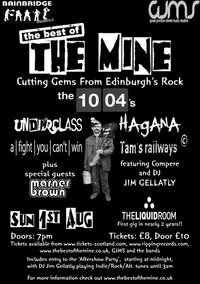 To celebrate The Mine’s first birthday, the Liquid Room is filled, for the first time since it burned to the ground in 2008, with live music fans ready to rock out to a showcase of Edinburgh bands that have graced the Wee Red Bar stage for ‘The Mine’ over the last twelve months. The honour of first band to play on the newly refitted Liquid Room stage is awarded to Tam’s Railways (pictured). As the cheeky Leith-based scamps batter through a set of upbeat rock, their sense of humour is evident in both their lyrics and mannerisms. Lanky bassist Gordo shows off some well thought-out counter melodies on the bass, which plug the hole left by their recently departed lead guitarist. Drummer Innes adds shade and intensity to the playful guitar parts, and lead singer Leigh’s broad Scots accent keeps the songs sounding urban and modern. The trio of A Fight You Can’t Win like to thrash away on their guitars like they are scratching chicken pox. Both guitar and bass boom with mushy lumps of low-end, and the songs mix heavy metal with alternative rock and then speed it up a little, with some chromatic chord progressions that allow a film of grunge to float to the surface. Some sound issues prevent this from being quite the triumphant performance it ought to be, but the issues are smoothed out by the next band. Hagana’s dirty rock, earthy riffs and decidedly grunge vocals have never sounded clearer than they do on The Liquid Room stage. What the regular band lack in performance skills is made up for (and then some) by the antics of Big Hand’s trumpet player, Phil, who regularly joins the band for some of their tunes, playing trumpet or stylophone. Indeed the one ska song in Hagana’s set, ‘Baltic Connections’, seems like it was written just for Phil’s trumpet riff. Another highlight of the set is ‘Shelly’; as the lightest and most compassionate song in their set, the country/indie romp shows the band have the potential to write all kinds of different music when they try. Underclass’s set kicks off with the sound of a giant crystal statue in a forgotten desert that is suddenly split down the middle by a dual octave guitar riff. The psychedelica-meets-muscle rock five-piece produce a tight, polished sound with big sounding riffs on the axe and splashy hi-hat beats on the drums. The keyboard slides between some sparky analogue synth sounds and hot pub-rock piano. The vocals glow with Audioslave-esque strength and desire, and the lead singer performs the songs with the appropriate level of machismo. Although it’s not very macho to run off and hide behind the amps while the rest of the band set out on their eight minute prog-rock voyage near the end of the set. Next up, the first of two headline acts, special guest stars Marner Brown , have travelled up from London. In their neckerchiefs, scarves, loose vests, tight jeans, pointed boots, long shaggy hair and bristly chins, the quintet are ever-so-stylish. Their influences come from moody indie-punk on both sides of the ocean, be it Americans Black Rebel Motorcycle Club or The Strokes, or Brits like The Libertines and The Enemy. Growling vocals or buzzing distortion on the bass or guitar give the music its edge, and their practised stage persona gives their show its punch. In a rather similar chic, The 10:04s fill the second headline slot to the delight of a large gathering of indie scenesters. They are the best band whose name references ‘Back to the Future’ since McFly... OK, maybe that’s not a fair comparison. Like McFly, though, their riffs are catchy, and the two guitarists pass back and forth lead singer duties. Unlike McFly, however, the band pull a buoyant but edgy indie-punk sound and a leather jacket-wearing sense of style from the likes of The Strokes or The Cribs. Well-executed drums keep the band in good time even through their running-pace pulse rhythm power chord-filled tunes. This is music by indie kids for indie kids, and the crowd eat it up, especially set closer ‘About Tonight’, which has everyone dancing and joining in – and a small stage invasion! The lights go up, revealing that the Liquid Room has inexplicably been painted purple. Nonetheless, I think it’s fair to say that this venue is back with a vengeance.